Q: The Hindustan Times carried a report on June 28 about Indian Army Chief Bipin Rawat's remarks on the latest standoff between Chinese and Indian border troops. He said that there was no incursion into India, which is different from previous Indian media reports about the Chinese army's intrusion at the Sikkim section. What is China's comment on that? A: As we have said on this podium, what did happen was that the Indian border troops illegally crossed into the Chinese territory at the Sikkim section of the China-India boundary. What was told by the Indian army chief testifies that previous reports by the Indian media are not true. Truth may be concealed for a while, but not forever. We once again urge the Indian side to abide by the existing boundary convention, respect China's territorial sovereignty, and immediately bring the border troops that have crossed into China back to the Indian side of the boundary, so as not to worsen the situation and land itself in a more passive position. 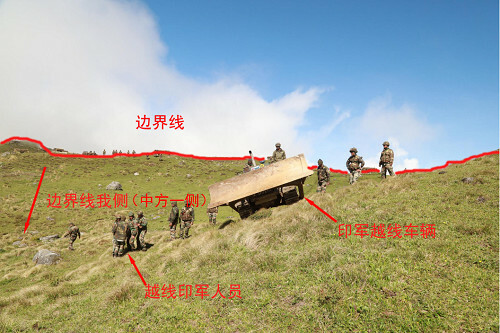 Q: The Chinese side asserts that the Indian troops, by crossing into the Chinese territory at the Sikkim section of the China-India boundary, have violated international law and basic norms governing international relations. Is there any legal ground for China's allegation? A: There is clear legal evidence to support the definition of the Sikkim section of the China-India boundary. In accordance with article one of the Convention Between Great Britain and China Relating to Sikkim and Tibet (1890), "the boundary of Sikkim and Tibet shall be the crest of the mountain range separating the waters flowing into the Sikkim Teesta and its affluents from the waters flowing into the Tibetan Mochu and northwards into other rivers of Tibet. The line commences at Mount Gipmochi on the Bhutan frontier, and follows the above-mentioned water-parting to the point where it meets Nipal territory." From this we can see that Doklam belongs to China. The water-parting in the area where the Indian troops trespassed is distinct. 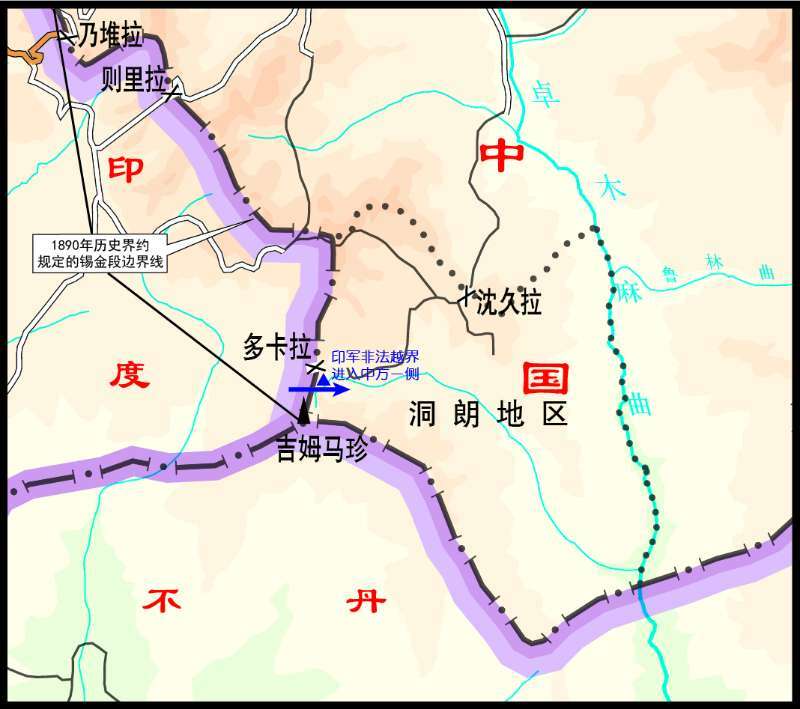 It is an irrefutable fact that the Indian troops crossed into the Chinese territory. By doing so, they have violated the boundary convention and the commitment upheld by successive Indian governments. What I have at hand are pictures showing the trespass of the Indian border troops at the Sikkim section. We will post these pictures on the website of the Foreign Ministry after the press conference just in case you cannot see them clearly here. 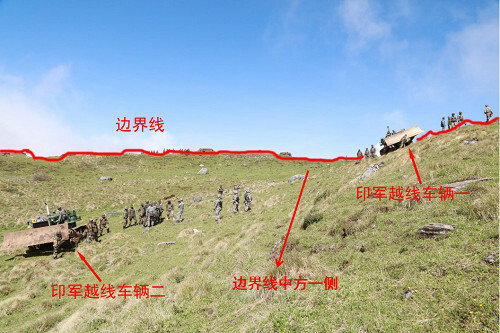 The pictures clearly show that the Indian soldiers and vehicles have overstepped the crest which is defined as the boundary and entered Chinese territory. Q: Yesterday Bhutan's ambassador to India said that the Bhutan government had lodged an official protest in a demarche asking China to stop road construction in the Doklam area. Can you confirm if the Chinese Embassy in Delhi has received this demarche? A: Doklam has been a part of China since ancient times. That is an indisputable fact supported by historical and jurisprudential evidence, and the ground situation. 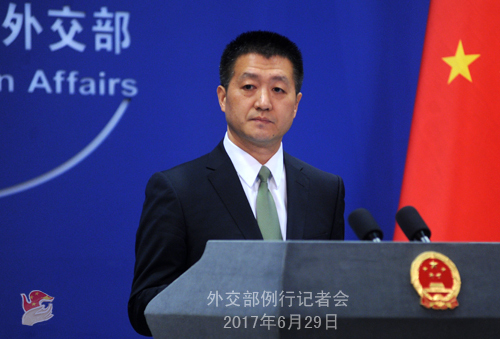 China's activities in Doklam are acts of sovereignty on its own territory. It is completely justified and lawful. Q: What kind of communication have China and India had on this issue? Will it be solved through diplomatic means? A: The Chinese side has repeatedly lodged solemn representations with the Indian side both in Beijing and Delhi since the trespass took place. There is a smooth line of communication between the two sides on this issue. We urge the Indian side to immediately pull back the border troops to the Indian side of the boundary. That is the precondition for any meaningful talks between the two sides aiming at resolving the issue. Q: There is a bill moving to the US Senate that would allow US Navy vessels to dock at Taiwan ports. What's your comment on that? A: I believe you know fairly well China's position on the Taiwan question. We are strongly concerned about and firmly opposed to the bill approved by the Senate Armed Services Committee. We have lodged solemn representations with the US side about its erroneous actions on Taiwan-related issues. I have to stress once again that the Taiwan question bears on China's sovereignty and territorial integrity, and belongs to China's domestic affairs. Taiwan-related contents in the aforementioned bill severely violate the three joint communiqués between China and the US, and constitute interference in China's domestic affairs. China by no means accepts that. We urge the US to honor its commitment on the Taiwan question, immediately stop military contact and arms sales to Taiwan, and avoid causing damage to the bilateral relationship and bilateral cooperation in a broader range of areas. 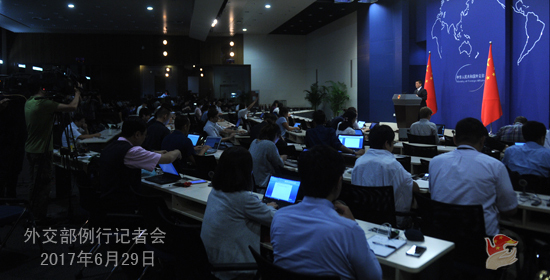 Q: It is reported that the 23rd China Lanzhou Investment and Trade Fair will be held in the city of Lanzhou, Gansu province from July 6 to 9. The Belt and Road initiative will figure prominently at the fair. Nepal is one of the guests of honor for the event. Will any Nepalese leaders attend the event and can you tell us more about the exchanges and pragmatic cooperation in various fields between China and Nepal? A: The Chinese side views Nepal as an important cooperative partner for the building of the Belt and Road and welcomes Nepal's participation at the 23rd China Lanzhou Investment and Trade Fair as a guest of honor. The two sides are communicating on the attendance of Nepal's high-level delegation. China and Nepal are neighbours enjoying traditional friendship. Recent years have seen the rapid development of bilateral cooperation in various fields and the continuous growth of friendly relations between the two countries. In the first half of this year, the then Prime Minister Pushpa Kamal Dahal Prachanda of Nepal came to China for the Boao Forum for Asia (BFA) annual conference 2017, and Vice Prime Minister Krishna Bahadur Mahara came to China for the high-level dialogue of the Belt and Road Forum for International Cooperation. Leaders of the two countries have reached broad consensus in such areas as connectivity, free trade and post-disaster reconstruction and inked an inter-governmental memorandum of understanding on cooperation under the Belt and Road initiative. Not long ago, the two sides held fruitful diplomatic consultations. The Chinese side will take the opportunity of jointly pushing forward the Belt and Road initiative to cement China-Nepal traditional friendship and expand mutually beneficial cooperation so as to move forward the comprehensive cooperative partnership featuring ever-lasting friendship between the two countries. Q: The Global Times has a report saying that the Australian government has been harassing and spying on Chinese citizens and embassy, can you confirm whether this is correct and is China worried about the behavior of Australian security agents with regard to its citizens in Australia? A: I have also taken note of the report. 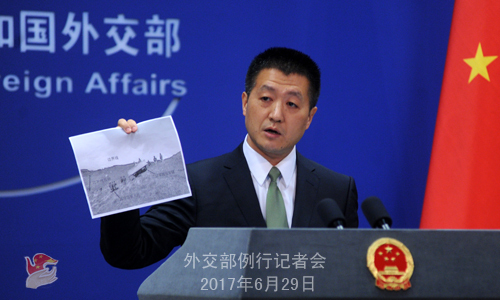 We keep a watching eye on any countries' moves against China's national security, and will take necessary measures in response. And the report you mentioned also reminds me of the Australian media's speculation of the so-called Chinese spies. How about you ask those Australian media for their views on the Global Times report. Q: Colombian President Juan Manuel Santos and top commander of the Revolutionary Armed Forces of Colombia (FARC) Rodrigo Londono jointly witnessed FARC relinquishing weapons in Mesetas. President Santos said that the conclusion of disarmament shows that peace in Colombia is real and irreversible, and that Colombia has opened up a new chapter of post-conflict reconstruction. What is China's comment on that? A: China congratulates Colombia on reaching such a major milestone in its peace process, and commends all relevant parties for their tireless efforts. 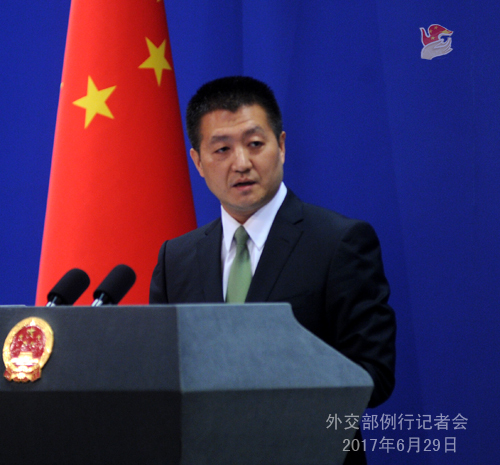 The Chinese side will continue to stand firmly for the peace process in Colombia. May the new peace accord be fully and smoothly implemented, and the Colombian people embrace general peace at an early date. Q: The Philippines announced on Wednesday that China has donated thousands of guns to help them battle terrorism. Is China going to provide any other type of aid to the Philippines? A: You may have already seen the relevant report, including statements by President Duterte and the Chinese ambassador to the Philippines. Terrorism is the common enemy of all mankind. The Philippine government is fully committed to fighting terrorism in Marawi. We have said on many occasions that the Chinese side firmly supports the Philippine government's counter-terrorism efforts led by President Duterte. As you just said, the Chinese side has provided some assistance to the Philippines, and will continue to offer our support as our capacity allows.